Looking at HbE performance relative to team placement. 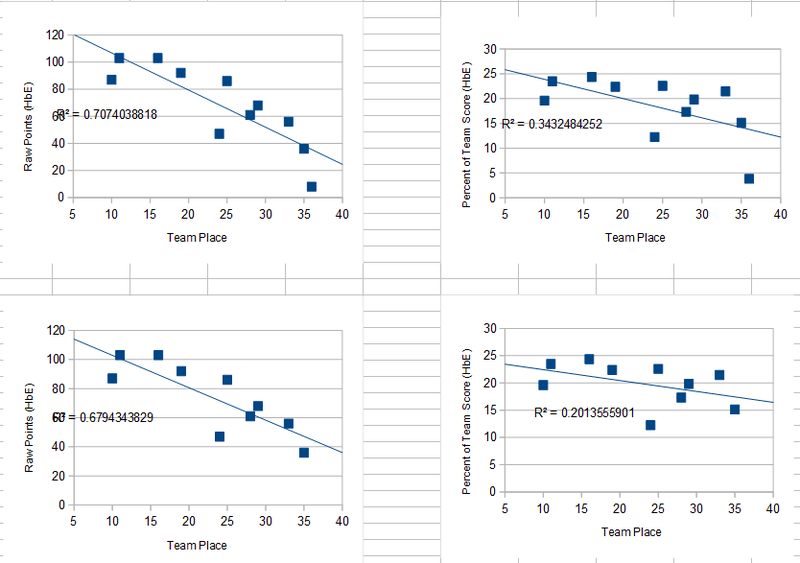 Right Graphs: HbE % of Team Score vs. Team Placement (basically, factoring out team point total covariation). Lower Graphs: As above with 36th place Slovakia's HbE removed (a priori and ad hoc posteriori justifications: a priori - brand new player who was there solely to fill the team, had no tournament experience at all. Ad hoc posteriori - 14% of the explanatory power of HbE % is due to that one data point, so it's seriously different than the other points). Takeaway: I'm not interested in significance here, only explanatory power (although it would be reasonably easy to assess significance). Correcting for total team points (ie, looking at HbE performance relative to team mates) reduces explanatory power by a huge amount - it goes from explaining 67% of the variance to 20%! That means that the real story here isn't HbE, it's total team points. (Which of course it is - there's a reason this needed to be corrected for - autocorrelation is an issue).